The Harford Park Community Association is a 501(c)(3) non-profit that has existed for development of the general welfare for the Harford Park neighborhood continuously since October 5, 1939. Harford Park is defined as the section of Baltimore City and Baltimore County, Maryland bounded by the south side of Taylor Avenue, the north side of Moore Avenue, the east side of Oakleigh Road and the west side of Old Harford Road. Harford Park is a unique community, straddling the legally fixed border between the city and the county and needing to work with two governments with different priorities for and attention to our little suburban neighborhood. 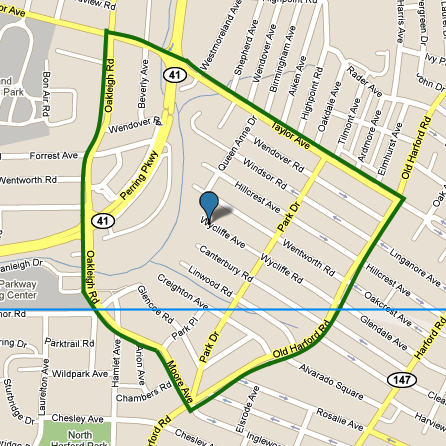 In Baltimore City, Harford Park is considered a portion of the larger Harford-Echodale/Perring Parkway neighborhood. Check out the health of that larger neighborhood here. For more information, see City-Data.com. The following is a list of properties that make up Harford Park. Send corrections to this list to info@harfordpark.org.